Is the existence of Triple point a coincidence? how does one explain existence of a three way junction? Is it the junction of a part of the graph that is under the solid,liquid and gaseous phase? The three way junction is there because that is where the three phases (solid, liquid and vapour) of a substance can coexist in thermodynamic equilibrium with one another. At all other temperatures only two (or one) phases can co-exist together in equilibrium. You might say that you can have ice in a beaker of water with the top of the beaker covered and eventually the ice and the water and the water vapour will all reach the same temperature. So here you have all three phases of water in equilibrium with one another and so it must be the triple point. That is not so because there is also air present which upsets the equilibrium. Referring to the graph which you have provided which happens to be for water I think? I imagine that you had a sample of pure water in a container and you could vary the pressure and the temperature within the container. The phase diagram shows you for each value of pressure and temperature what will be happening to the water inside your container. 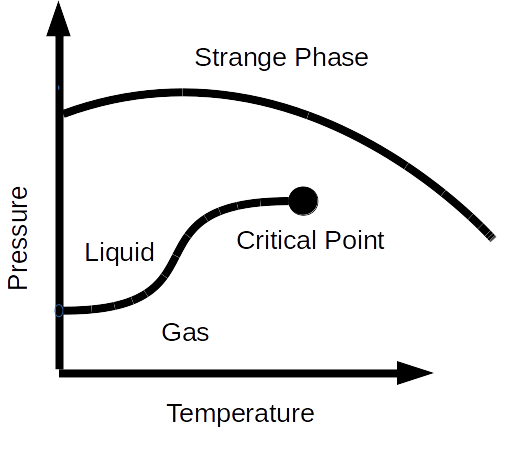 For example suppose you kept the temperature of the container at a fixed temperature which was above the triple point temperature but below the critical temperature and varied the pressure within the container starting from a very low pressure, every time waiting for the water to reach an equilibrium state. Initially inside the container there would be just water vapour but as the pressure increased you would reach a pressure (actually called the saturated vapour pressure) when both water liquid and water vapour could coexist with one another. The blue line is the saturated vapour pressure against temperature graph. Increasing the pressure further you would have only water liquid in your container. If you repeated the experiment at the triple point temperature, at low pressures you would first have water vapour but at a certain pressure you would find that all three phases of water, solid, liquid and vapour, are coexist together in equilibrium. Increasing the pressure further would result in only water liquid being in your container. The temperature at which the solid, liquid and vapour phases are in equilibrium is well defined enough to make triple point cells containing pure substance reference points for the calibration of thermometers. You can gauge the extent to which purity is defined by reading the section Unit Of Thermodynamic Temperature (kelvin) p113-114. They even define the isotopic composition of the water. I not know what you meant by the word coincidence. The triple point is not unique to water. The existence of a triple point is not a coincidence at all. It will be a necessary feature as soon as you have three different phases in your phase diagram that can all be reach from each other. It's like when you have three countries that all share borders. By geometry alone there has to be a point were the borders intersect. The position of the triple point, however, will of-course depend on the details of the substance at hand. However, I know myself of no such phase. Apart from this I don't see how you can avoid the triple point. (I'm happy to be shown another (non-trivial) example where the triple point is avoided). IN COMMENT: You may also be interested in looking at Gibbs' phase rule. 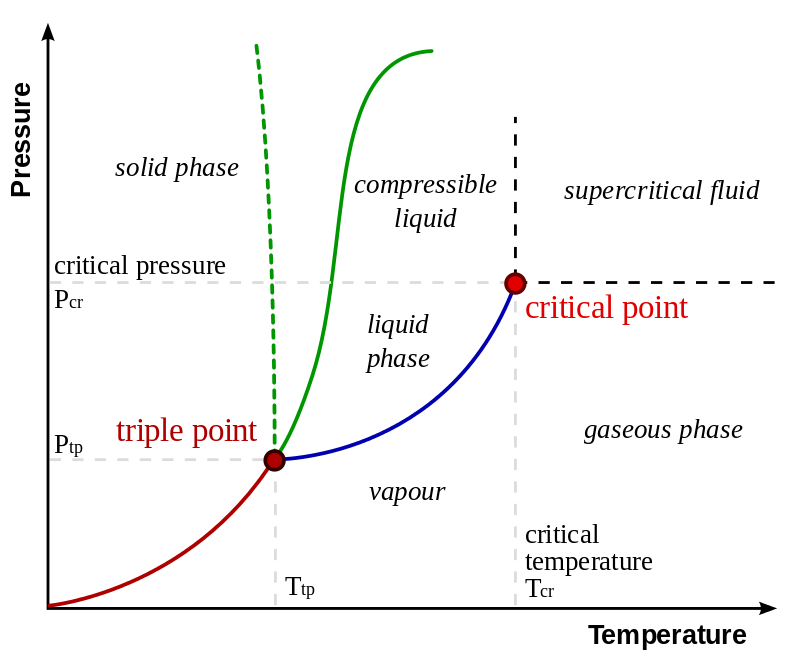 In thermodynamics, how does the triple point occur? How does the temperature of the triple point of water depend on gravitational acceleration? How to realize the triple point of water? How do we explain the existence of liquids, from a mathematical or computational perspective? Why should the vapor pressure exist at all tempratures?